How can grams help us compare weights? In their last investigations, students experimented with nonstandard units of meaure — paper clips, washers, and counting bears. In this investigation they explore — perhaps for the first time — an important unit of weight in the metric system: the gram. Students weigh a variety of familiar objects in terms of grams and place those objects on the weight line. They then study the distribution of objects on the weight line, comparing size and weight. 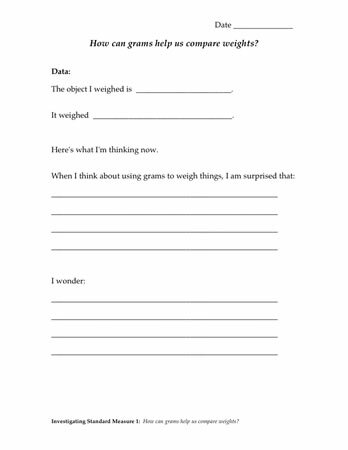 By the end of the investigation, students will be thinking of objects in terms of their gram weight. They will also be noticing that size and weight do not always correspond. The plastic weight line — If your weight line has been left in view since the last class, make sure the students can get to it. If not, place the weight line in an easily accessible place. Hand a gram weight to each child. Is there is anything else you can think of that might weigh about the same as this piece of plastic? Tell students they are now holding a piece of plastic that weighs 1 gram. Scientists and many people in the world use grams to describe the weight of objects. Distribute large paper clips (1.2 grams) to the students to provide another example of an object that weighs about a gram. Mention that most things in the classroom weigh more than one gram, and that students will have a chance to weigh some of them later today. Students will now use grams, not steel washers, paper clips, or bears, to describe how much something weighs. Why do you think it might be better to use grams instead of paper clips, washers, or plastic bears? Are you more used to hearing about “pounds” when someone is talking about measuring weight? Explain that a pound is a different unit of weight, much heavier than one gram. One pound weighs 454 grams. A gram is a fairly small unit of measure that will help them compare weights even when the difference is pretty small. Show students the rest of the weights in the gram weight set: the 5–gram, 10–gram, and 20–gram pieces. Hand around enough weights for each student to experience the different weights. Think together about classroom objects that might weigh 5 grams, 10 grams, or 20 grams? Use a pan balance to check the guesses. Note: When students used steel washers or paper clips, every item had a unit weight of 1. Using the of gram weights, students will have not just 1-gram pieces, but also 5-gram, 10-gram, and 20-gram pieces. Some students will be unfamiliar with how to take advantage of this new system. For example, to balance an object that weighs 26 grams, they may use 26 1-gram pieces instead of using a 20-gram piece, a 5-gram piece, and a 1-gram piece. The student balances his green pom pom with three gram weights. Provide each student one object from the Materials and Preparation list to weigh. Remind students to check their pan balances to see if they need adjustment and to be sure to handle them carefully. 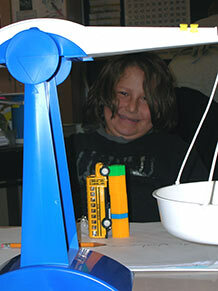 Each student weighs an object and records the name of the object and its weight in their notebook. 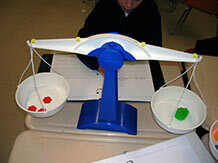 Students might try to estimate the weights of objects that are to be weighed. Note: If possible, set up the weight line in a place where it can remain for several days, perhaps against a wall. Meet together at the weight line. Explain that the numbers will now stand for grams and not for steel washers, counting bears, or paper clips. Place the index card labeled “Grams” at the start of the weight line. Let students know the importance of always specifying a unit of measure whenever they talk about the weight of their objects. Invite each student to add his or her object to the weight line and to say something about its weight. Make sure each child specifies the unit of measure: grams. The purpose of the discussion is to consolidate understanding that the gram is the standard unit for measuring weight and that weight can be represented on a weight line. Set the stage for the discussion by reviewing the weight line. 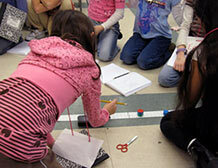 Check students’ understanding of using “distance from zero” to represent weight. Confirm that they understand that the weight line is continuous, i.e., that objects can fall anywhere on the line — either very close together or very far apart — and all still be part of the same line. Ask the class what they think about grams as a unit of measure. Are grams easier to use than paper clips or counting bears? Were you able to estimate gram weights accurately? Would pounds work as well as grams for weighing the objects? Why or why not? What are the advantages of grams if we want to compare weights? Finally, return students’ attention to the weight line and start a discussion about the relationship between size and weight. Are there objects that weigh about the same but have different sizes? Can anyone explain how this can happen? Are there objects here that are just 1 gram different in weight? Can objects be closer than 1 gram in weight? What are the lightest objects on the line? How many grams do they weigh? How do the sizes of the light objects compare? Are there any surprises? What are the heaviest objects on the line? How many grams do they weigh? How do the sizes of the heavy objects compare? Any surprises? Students should now be describing their observations in terms of grams. They should begin to puzzle about the relationship between size and weight. Provide time for students to reflect and write responses in the Here’s what I’m thinking now section of the Notebook page.